While in the last few weeks, Lindt has exploded with new flavours across many of their subranges, I'm still struggling to catch up! A new addition to the ever-expanding Excellence range, Zest of Lime was released mid-last year. 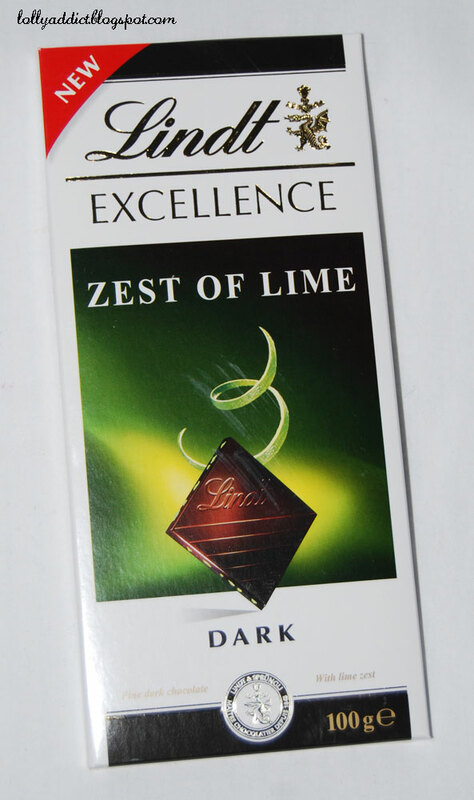 Like many other flavours in the range, Zest of Lime is built on dark chocolate, although it is not exceptionally dark (by Lindt's standards, anyway). The 100g block uses 47% cocoa solids, only a smidgen up from Cadbury's Old Gold range (at 45% cocoa solids). But unlike some of the other Excellence blocks, this one does not include flaked almonds - it's just dark chocolate and lime zest. The ingredients list is pleasingly short, too, with only seven ingredients. The block has a surprisingly bright and fresh scent to it - the zest gives out quite a fragrance. Curiously, it's rather sweet, but it makes me want to try it all the more! The reverse side of the block is speckled with the bumps of lime, giving it a nice texture. 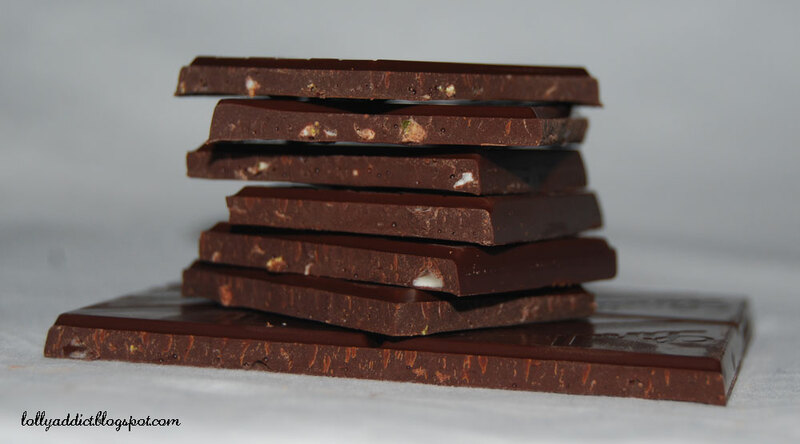 The chocolate has a great melt, smooth and evenly tempered. The flavour is curiously; lots of citrus notes that complement the slightly earthy flavour of the chocolate. Though I couldn't probably pick it as lime, it is refreshing and quite pleasant. The pieces of lime zest, which have been freeze dried, are actually quite large - you can see them in the photo below. As they are so large, they had an immediate presence in the mouth, and I didn't really enjoy their sharp edges interrupting my smooth chocolate experience (but I'm not a huge fan of 'things' in my chocolate anyway). The pieces themselves are kind of like little nubs - some are hard and some can be crunched. I wasn't expecting this flavour combination to work at all,but again Lindt has come up with another winner. I would just really like to see the removal of the zest so that the smooth mouthfeel can be fully enjoyed. 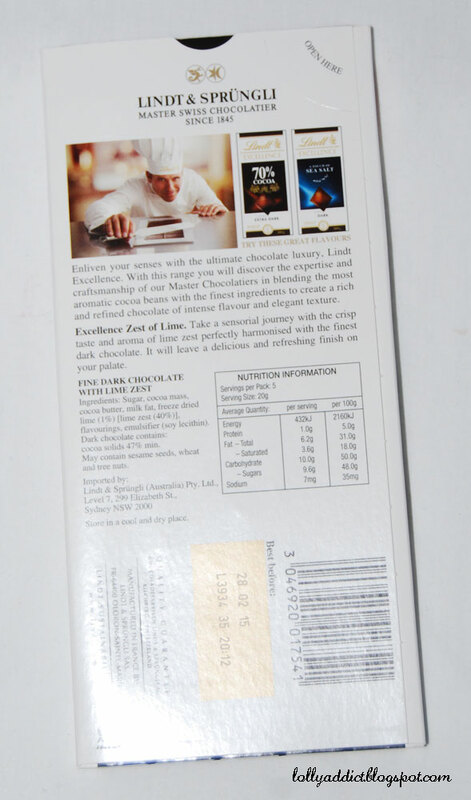 Lindt Excellence Zest of Lime is made in France and contains soy. It may contain sesame seeds, wheat and tree nuts. Gossip: new M&M's, new Pods and new Mentos!